Giving Tuesday is becoming one of my favorite days of the year. Designing a campaign to help Plant With Purpose raise enough funds to help 250 families out of poverty has been a blast, and I look forward to rolling it out just after Thanksgiving. Plant With Purpose’s program works really well at a family level. Every day, I get to hear stories of families who are eating an extra meal each day, moving out of mud homes and into secure structures, and putting their sons and daughters through school. These are families who have spent years thinking that sort of thing would always be out of their reach. 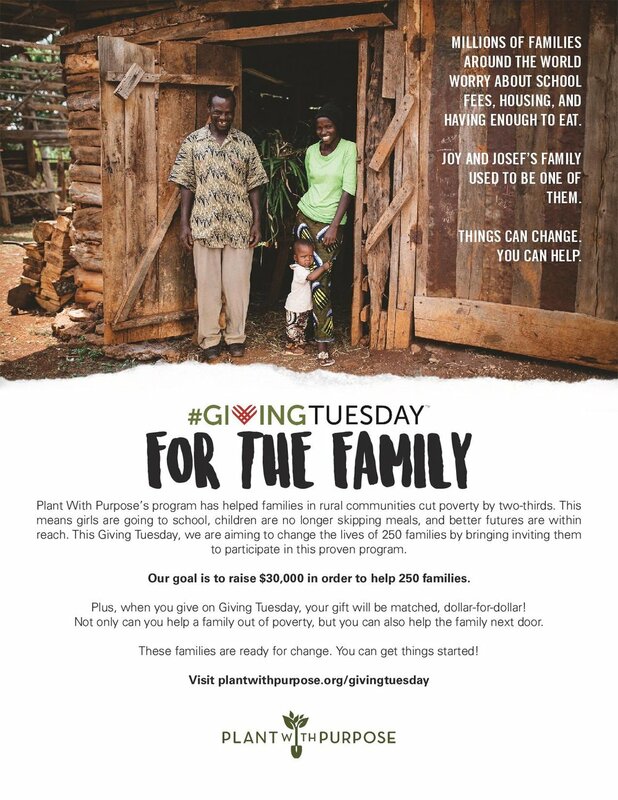 It costs about $122 for Plant With Purpose to start a partnership with a new family, but any amount given goes towards that. For Giving Tuesday, a generous donor has offered to match all donations up to $17,000- meaning that we’ll be able to help an incredible amount of people around the world.